The appeal of Pokémon Go is in large part due to the game’s introduction of locative augmented reality (AR) to popular media culture, as players’ mobile phones summon virtual creatures and overlay them on the immediate environment. The significance of this novel device (within popular children’s culture at least) is open to question however. The workings of imagination in children’s lives have always populated mundane experience with non-actual actions and characters – from elaborate fantasy worlds spun off in talk and gesture from play with dolls, building blocks or tree stumps and manhole covers (Factor 2004), the fleeting moments of jokes, songs and daydreams (Opie 1993), to intimate relationships with a precious toy or imaginary friend (Winnicott 1974). Over recent decades these processes have been mechanized and monetized by commercial children’s toy and media culture, not least in the transmedia system of Pokémon itself. What can critical attention to imagination and technology in pre- and post-digital play tell us about the hybrid realities of Pokémon Go today. For all its apparent novelty then, there is much that is familiar in the everyday worlds of Pokémon Go. Any parent whose children are or have been fans of Pokémon – or even any young adult today who fondly remembers growing up with the games, the cards, the books, the merchandise in the late 1990s and 2000s – will find in its augmented reality overlay of the phenomenal world and virtual characters visual echoes of other, earlier Pokémon experiences. Just as the world of Pokémon Go, as viewed through the mobile screen, is populated and animated by these vivid creatures, so too the everyday environment of the earlier Pokémon fan was plastered with posters and stickers, shelves, pockets, and back yards filled with card collections, toys, comics and merchandise, all neatly ordered or scattered as debris, gathering in corners and under furniture. The Game Boy games were the harbingers of the mobile digital media culture to come, the pocket monsters chased and collected on the screen within and across mundane spaces and journeys. In this sense the augmentation or layering of children’s everyday visual environment is nothing new: the lives of comfortably-off children have been full of toys and books, and their attendant monsters and dramatic narratives of exploration and conflict, since the nineteenth century, and with media culture from the 1950s onwards children’s reality has been replete with brightly coloured and clearly outlined characters with their strict and commodified attributes. Then, as now, it is not only the visual dimension of children’s everyday lives that is populated by Mickey Mouse and Pikachu, it is also – again as parents will know only too well – the aural environment, the constant chatter and questioning of the Pokémon fan. From puzzling over a deadend in a Game Boy game and talking with friends about possible cheats or tips, to testing and interrogating parents about their favourite Pokémon, players project these characters, attributes, collections, journeys and battles, onto and into the environment around them. My analogy of the layering of realities in Pokémon Go’s AR and the layering of realities in the playing child’s imagination and media life is deliberate and non-metaphorical, however the formal and lived relationships between Pokémon Go’s AR techniques and children’s everyday imaginative projections are also materially and technically distinct. To explore both their continuities and differences in animating (and being animated by) imaginative play I would argue that a working notion of the relationships between imagination and the material world is needed, with particular attention paid to the material agencies and affordances of technology in particular (Giddings 2014). The concept of distributed imagination has been used in studies of children’s playful communication to emphasise the complex intersubjectivity of imaginative play (Alcock 2010). Here imagination is a social phenomenon rather than a solitary, internal process as it is generally characterised. Much of children’s imaginative play is communicative and collective. The worlds, entities and dramas imagined never exist in any one individual’s head; these castles are built in an intersubjective sky. They have no actual existence, but their effects in daily life and experience are real. technologies become part of and support children’s movement and comprise an energy that knits them together; technology is continually altering and remaking ways in which children experience and interact with the human and non-human world (Ruckenstein 2013: 354). Mizuko Ito’s ethnographic work with young consumers of popular transmedia systems such as Pokémon traces a ‘mobilization’ of imagination, as these media platforms inspire, indeed necessitate, inquisitive, creative and social modes of imaginative play (Ito 2011). In solving game puzzles, collecting and swapping cards, personalising items, linking consoles together to share items, powers and characters, playful technological platforms scaffold imaginative enquiry, exploration, and the collection and sharing of virtual creatures and knowledge. The transmedia universe of Pokémon is a techno-aesthetic platform that facilitates particular kinds of imaginative engagement, from the rule-bound and intentional, to more unpredictable and expansive semiotic and performative play (see also Sefton-Green 2000). Any act of play beyond daydreaming such play with toys, drawing, climbing trees or engaging with television involves the manipulation of objects, bodies and environments to some extent. Thus there are an infinite number of ways in which reality is augmented in play – augmentations that structure, are reciprocally structured by, and layered with, their material and technical realities. From this perspective the AR of Pokémon Go is just one example, albeit aparticularly vivid and technically complicated one. As well as recognising this continuity however, a critical understanding of distributed imagination must also address the material specificity and novelty of the environments and agents in any particular event or environment of play. Pokémon Go is integral to a rapidly changing digital economy of attention in which imagination is mobilised by, and flows through, the temporal dimensions of mobile and social media games, as well as their spatial, narrative and economic dimensions. In-app payments and microtransactions integrate monetisation into the time and behaviour of play itself. 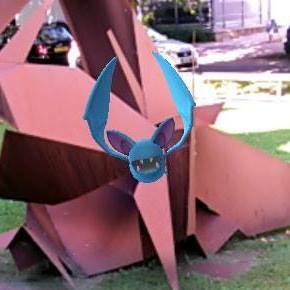 Critical attention to the distribution of imagination and layering of reality through Pokémon Go then should be trained on the specific machinations of the digital and social media attention economy, whilst acknowledging the always-already technological nature of imaginative play, and hence rejecting nostalgia for a mythical pre-technological age in play culture. Alcock, Sophie (2010) ‘Young children’s playfully complex communication: distributed imagination’. European Early Childhood Education Research Journal. 18(2): 215-228. Bateson, Gregory (2000 ) Steps to an Ecology of Mind. Chicago IL: Chicago University Press. Factor, June (2004) ‘Treestumps, manhole covers, and rubbish tins: the invisibile playlines of a primary school playground’. Childhood 11(2), 142-154. Giddings, Seth (2014) Gameworlds: virtual media and children’s everyday play. New York: Bloomsbury. Hutchins, Edwin (1995) Cognition in the Wild. Cambridge MA: MIT Press. Ito, Mizuko (2011) ‘Mobilizing imagination in everyday play: the case of Japanese media mixes’, in Seth Giddings and Martin Lister (eds) The New Media & Technocultures Reader. London: Routledge, 491-505. Opie, Iona (1993) The People in the Playground. Oxford: Oxford University Press. Ruckenstein, Minna (2013) ‘Playing Nintendogs: desire, distributed agency and potentials of prosumption’, Journal of Consumer Culture 15(3), 351-370. Sefton-Green, Julian (2004) ‘Initiation rites: a small boy in a Poke-world’, in Joseph Tobin (ed.) Pikachu’s Global Adventure: the rise and fall of Pokemon. Duke University Press, 141-164. Winnicott, D.W. (1974) Playing and Reality. London: Routledge.